I'm so excited about this that I changed what I had previously planed for today so I could share it with you! Ever since I started making amigurumi my peeve has been stripes! I like the extra detail it gives to the doll, but I reaaally don't like the fact that you can always see where the color was changed. The image above shows four different ways of changing colors when making stripes, but in everyone (some more than others) you can see where the color change was made. There's always an extra something that gives it away. But now I can safely say I found my new favorite way of making stripes on amigurumi! I came across this new wonder when reading a guest tutorial by Jennifer Crowley on FreshStitches. The trick is using the Barberpole or Helix Stripping and work it up instead of out! 1. Work 3 single crochet into a Magic Ring with the first color (blue). Use a stitch marker to mark the first stitch. 2. Take the hook from the loop and make a slipknot on the hook with the second color (yellow). 3. Work 3 single crochet into the Magic Ring with the second color. 4. Close the Magic Ring. 6 stitches. 5. Continue to work with the yellow until reaching the last blue stitch. Work 2 single crochet in each stitch. 6. Switch to the blue yarn and work 2 single crochet in each stitch until the end of the round. 12 stitches. 7. Continue to work with the blue yarn: (1 single crochet, increase 2) until reaching the last yellow stitch. 8. 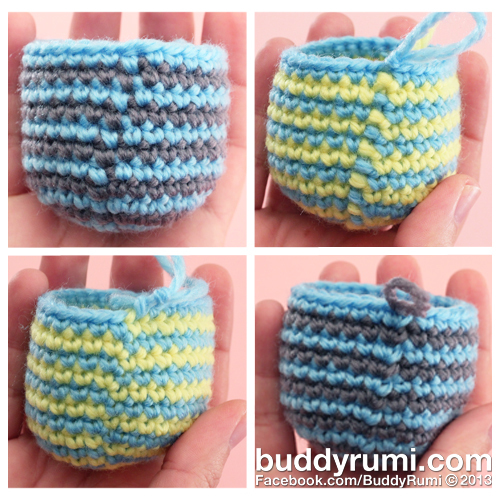 Switch to the yellow yarn and work: (1 single crochet, increase 2) until reaching the end of the round. 9. Continue to work in the same manner increasing 6 stitches each round until you have the desired width. 10. Work one single crochet in each stitch of the previous round and the work will grow upwards. From the side the spiral is now seen as stripes and because each color is worked on top of each other they continue without any interruption. 11. Jogless stripes everywhere you look! I've also figured how to make stripes with two rows of the same color. I used four skeins of two different colors. Two orange skeins and two dark blue skeins. Instead of working with increments of 6 stitches like before, I worked with increments of 8. I worked 2 single crochet with the first dark blue yarn, 2 single crochet with the second dark blue yarn, 2 single crochet with the first orange yarn and 2 single crochet with the second orange yarn, all in the Magic Ring (8 stitches). From there I increased 8 stitches in every round working as explained above.